The DVD market is saturated with obscure horror DVD’s nowadays thanks to the disappearance of the BBFC’s iron fist on censorship, growing demand from a wider fan base, and great DVD labels who are prepared to invest in movies, and who believe in the products that they are investing in. I'm going to start with one of my favourite obscure horrors Nature Morte. Paint me dead! The strange case of ten beautiful paintings, ten victims of a deranged serial killer and the suicide of a brilliant painter is investigated by an American art guru. From the south of France to Thailand, nothing is what it seems as he is drawn into a world of lust and depravity, where more paintings begin to surface and another artist begins to kill in order to create! I bought this based partly on a whim, partly on a bit of internet reviewer hearsay on the understanding that it was a fairly good film. Purchased on the Salvation Group label in April 2008, I thought that it would be, at the very least an interesting watch. To be honest, I was surprised at how good it was. I wasn’t expecting much but the story held my interest throughout, and even though it was clearly a low budget independent film it uses that minimal budget exceedingly well. 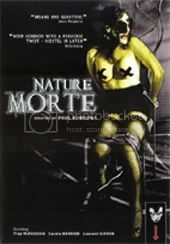 Directed by Paul Burrows, Nature Morte is more of a thriller than a horror per se but is a very bizarre and beautiful film, with certain scenes conjuring up an almost Rollin-esque quality; very dreamy and surreal. The music by Steve Severin coupled with the bizarre letterboxed aspect ratio on the Salvation DVD, certainly helps to support the cinematographic style, and as a whole the film works really well. If you do happen to come across this title and you have a spare 90 minutes, give it a watch and let me know what you think. sounds good. never heard of this before. nice cover too! will check it out asap.